Casino Forest is the tenth stage of Sonic Forces and the third stage to be played by Classic Sonic. 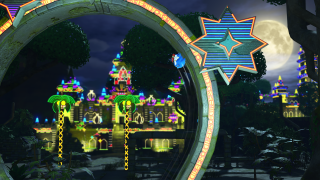 This stage is located in Mystic Jungle, a previously unspoiled jungle with ancient ruins that are being converted into a casino by Dr. Eggman. Casino Forest was originally an ancient ruin. After Dr. Eggman took over the planet, he began construction on the area to turn it into a casino. Several months later, Tails and Classic Sonic come to Casino Forest to find Sonic and tell him about Eggman's plan for wiping out the Resistance. While Classic Sonic searches Casino Forest for Sonic, Tails provides him with leads on where to look over the radio. By the time they reach the center of Casino Forest however, the duo finds nobody, although Tails remains confident that Sonic was somewhere nearby. Casino Forest fills the quota for casino-themed levels in that the majority of the stage revolves around pinball mechanics, with several sections designed like pinball tables. Areas are filled with pinball flippers, bumpers and drop targets to ricochet Sonic around, pinball launchers for catapulting him in a certain direction, and even slot machines that pay out Rings. Aside from pinball-themed elements, the stage also has moving ruin blocks that form staircases for the player to climb, spiked balls that move around, and high-speed warp tubes. Being a Classic Sonic stage, this stage is entirely in a 2.5D perspective. This page was last edited on 13 March 2018, at 08:06.